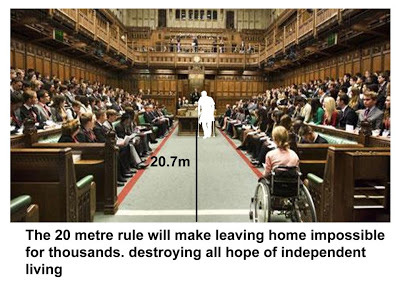 Changing the criteria for enhanced mobility component of PIP for those with physical difficulties getting around – in a nutshell the Government has now decided that anyone who can walk more than 20 metres (it was initially supposed to be 50m) does not reach the threshold for the enhanced mobility component (unless they have difficulty planning and following a journey). The DWP itself admits that 42% fewer claimants will be awarded the enhanced mobility component that would be the case if DLA continued. We estimate about 200 people in each constituency will be affected by the loss of their car, Wheelchair Accessible Vehicle or wheelchair. That’s over 100,000 people losing out on access to the crucial Motability scheme. Higher rate DLA (which is being replaced with the enhanced mobility component) is also a gateway to many other benefits such as disabled persons travel cards taxi-schemes, bus passes and fast-track access to the blue badge scheme. It has been hinted that the enhanced mobility will take over where Higher rate DLA leaves off. So the impact of this is even more than just the loss of monthly income & cars/wheelchairs. Excluding the qualification that claimants must be able to perform an activity ‘safely, reliably, repeatedly and in a timely manner’ from the regulations themselves. Campaigners, myself included, fear is that if these qualifiers are not included in the regulations, they will not be legally enforceable and tribunals may not be able to apply them on appeal. The Spartacus Campaign Group hope to get some legal advice on this as quickly as possible. If you combine this with the change above it means that theoretically someone who could walk a maximum of 25m once a month could have their mobility competent removed. A disaster for anyone with even a vaguely fluctuating condition. We have very little time to persuade MP’s that this is not acceptable. Please do what you can. A letter/email often works best but if you don’t feel up to it there are other ways you can get in contact; you can tweet your MP or post on their facebook page if they have one to spread the word. The grass roots team that brought us the Responsible Reform Report (known to many as the Spartacus Report) have launched a new report called Reversing Recovery. You can see pdfs of the summary or full version by clicking these links and if you go to the website there are links to accessible formats too. A new report has highlighted the dangers to the UK’s economy following an analysis of the impact of welfare reform on the motor industry. ‘Reversing from Recovery’, published by the WeareSpartacus campaign group, analyses figures supplied by the Department for Work and Pensions and Motability, the organisation that supplies lease cars to disabled people claiming Disability Living Allowance. The report focusses on some of the impacts of the government’s plans to reform Disability Living Allowance (DLA), and its proposal to remove 280,000 disabled people from claiming the higher mobility rate of DLA, which currently qualifies them to lease a car under the Motability scheme. The analysis estimates that, under DLA’s replacement benefit, Personal Independence Payments (PIP), there will be a 27% reduction in the number of working age disabled people, and a 17% reduction in the number of disabled people overall, qualifying for the Motability scheme. · Up to £324 million contribution to GDP from disabled people’s ability to undertake paid work. The report also raises concerns about future investment in the UK by car manufacturers, given the demand for new cars is going to drop as the government phases in its plans. The report is calling on the Government to give further consideration to the wider consequences of disability benefits reform, including consulting more widely, before finalising the regulations under the Welfare Reform Act. · The WeareSpartacus campaign group is an internet-based group of disabled and sick people from around the UK which campaigns for welfare benefits and social care services that enable disabled and sick people to live independently and with dignity.